In 1993, an elite group of American Rangers and Delta Force soldiers are sent to Somalia on a critical mission to capture a violent warlord whose corrupt regime has lead to the starvation of hundreds of thousands of Somalis. 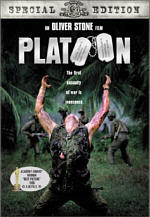 When the mission goes terribly wrong, the men find themselves outnumbered and literally fighting for their lives. Opening weekend $274,347 million on 4 screens. Rated R for intense, realistic, graphic war violence, and for language. Won for Best Editing; Best Sound. Nominated for Best Director-Ridley Scott; Best Cinematography. When Hollywood turns its focus toward war, it usually concentrates on one of two different conflicts: World War II or the Vietnam War. Partially due to the fact it ended a couple of decades before the US entered Vietnam, WWII fills more cinematic slots, but the later war nonetheless has certainly received plenty of attention. Actually, Vietnam was the subject of many of the best-regard war films ever, with pictures like Platoon and Apocalypse Now. Flicks about both conflicts continue to pop up on screens from time to time. Nonetheless, one can understand if filmmakers would like to expand to other arenas. For some, that means a look back in time, such as 2000’s examination of the Revolutionary War via The Patriot. More modern battles have been tougher to find. 1999’s Three Kings examined the Gulf War, but that issue hasn’t generated much cinematic interest. For 2001’s Black Hawk Down, director Ridley Scott looked at a war that wasn’t officially a war, at least not for the participants on whom he focused. In the early Nineties, Somalia went through a civil war, and as a result, the country suffered from a famine; warring parties would seize food shipments and not divert them to the citizens. United Nations forces intervened to attempt to occupy the country and re-establish a more democratic form of government. Much of their efforts went toward the capture of Somali leader Mohamed Farah Aideed. On October 3, 1993, US Army Rangers sought to snag two of Aideed’s top leaders. Black Hawk Down offers coverage of those events. We meet many of the Rangers involved and watch as the actions unfold. Initially, the forces believe the intervention will take only an hour or so, but when they encounter stiff resistance, problems develop. One Army helicopter – a Black Hawk, hence the movie’s title – gets shot down, and behind their motto that “no one gets left behind”, the other soldiers do their best to retrieve all of their fallen comrades. Unfortunately, this doesn’t go well. The planned brief action takes hours as the Somali resistance injures more and more men. The vast majority of Hawk concentrates on these actions, as we watch the grim tale unfold. Hawk enjoys a solid pedigree. In addition to the talent of Scott behind the camera, mega-successful producer Jerry Bruckheimer works his magic on it as well. The movie also provides a slew of fine actors, as we find folks such as Tom Sizemore, Ewan McGregor, Sam Shepard, and Josh Hartnett, among many others. Too many others, to be honest, as Hawk suffers from such a large cast that it loses much focus. I often assert that war stories are best told when they focus on a small number of participants. These tales take on greater power when we more fully feel the loss and the pain. With a huge roster of folks, we can see the scope of the conflict more clearly, but conversely, we experience less of the human anguish. Hawk definitely spreads itself too thin. The movie doesn’t attempt to cover all of the 100-plus US soldiers involved, of course, but it still concentrates on far too many of them. The film includes scads of semi-significant roles, and as a result, almost none of them stand out from the crowd. Even though the soldiers’ names were written on their helmets, I still couldn’t really keep track of them. I often could only recall characters if I recognized the actor; if I didn’t already know the performer, I usually lost track of the personality. Actually, that’s not totally true, for a couple of guys - Ranger Specialist Shawn Nelson (Ewen Bremner) and Sgt. First Class Norm "Hoot" Hooten (Eric Bana) – stood out to me even though I didn’t recognize the actors. Nonetheless, they were exceptions to the rule. Speaking of the cast, Hawk includes a surprisingly high number of non-US actors playing Americans. Bana, Bremner, Ewan McGregor, Jason Isaacs and others all come from across various ponds. Interestingly, Bremner also shared screentime with some of the cast in earlier films. He appeared in Trainspotting with McGregor, and he also showed up in 2001’s Pearl Harbor with Hartnett. Incredibly, the latter actor featured in six movies that hit screens in 2001! Enough cast trivia – back to the movie! While the lack of real character development bothers me, I wouldn’t say it causes the heaviest problems with Hawk. Instead, the movie’s odd ambivalence creates the most concerns. When people see Bruckheimer’s name attached to a project, they assume it’ll be a rah-rah popcorn flick. I think Bruckheimer’s material offers greater subtlety than some believe, but I can’t offer much of an argument against that consensus. And that’s fine with me. When you see the Bruckheimer stamp on a film, you generally know what you’ll get. Some of his flicks are better than others, but there’s usually a reasonable guarantee of a certain level of quality. Whether this is good or bad remains for individual viewers to decide; while I don’t like the vague sameness found in his films, I do at least appreciate the fact that most offer a reasonably exciting experience. Hawk clearly is supposed to be a grittier and more serious piece than the usual Bruckheimer fluff flick, and that’s part of the problem. Neither Bruckheimer nor Scott really seems willing to go all the way. Of course, one could argue the same with Steven Spielberg’s Saving Private Ryan; even with all the film’s noted gore, it still suffered from some stereotypical Spielbergian sappiness at times. Happily, Hawk dispenses with the jingoism often found in Bruckheimer productions, but it doesn’t seem quite able to take things to their appropriate extremes. Hawk wants to be gritty. Scott uses a semi-documentary style much of the time, and it exhibits occasional examples of graphic carnage, though it never approaches Ryan levels. And that’s part of the problem. It feels like the filmmakers couldn’t decide if they wanted Hawk to be an “R” or a “PG-13” flick, and the tentative nature of the production harms it. However, the issues don’t relate explicitly to the lack of significant buckets of blood. Instead, they come across more strongly via the film’s ambivalent take on its subject. Scott and Bruckheimer avoid the “hey hey, USA!” tone one might expect, but they also fail to provide any remote sense of balance between the conflict’s two sides. Only one sad little scene tries to explain the Somali point of view, as captured pilot Mike Durant (Ron Eldard) chats with his abductor. This segment really feels tacked-on and gratuitous, and it actually compounds the movie’s absence of counterpoint. Clearly Black Hawk Down focuses on a compelling and worthwhile subject, and at times, the movie becomes dynamic. However, as a whole I think it fails to become terribly engaging. The movie kept me at a distance much of the time, and for a variety of reasons, I never really got involved in the story or the characters. Hawk can’t decide if it wants to be Apocalypse Now or The Rock, and the film suffers for it. 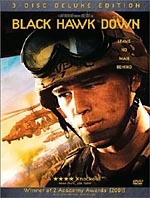 Black Hawk Down appears in an aspect ratio of approximately 2.35:1 on this single-sided, double-layered DVD; the image has been enhanced for 16X9 televisions. Despite the highly stylized photography evident throughout the movie, I found Hawk to offer a very solid picture. Sharpness always appeared immaculate. Even during extreme wide shots, I found the image to remain nicely crisp and well defined. At no point did I discern any signs of softness or fuzziness in this tight picture. Some minor moiré effects cropped up when mesh netting appeared, but those were slight, and I detected no concerns related to jagged edges or edge enhancement. Print flaws also seemed absent. As part of the production design, some moderate grain showed up on occasion, but I thought this appeared insubstantial, and I didn’t feel it interfered with the presentation. Otherwise, the image seemed to be totally free of any defects such as grit, speckles, marks or other issues. Hawk featured a very stylized palette. Most of the movie offered intense tans and greens, with an occasional splash of red or blue tossed in as well. Despite the inherently bland look of the film, I felt the DVD replicated the tones quite nicely. The colors appeared vivid and distinct at all times, as I saw no signs of bleeding, noise, or other concerns. Black levels also came across as dense and rich, while shadow detail was appropriately thick but not excessively heavy. Overall, Black Hawk Down provided a strong visual experience. Also positive was the film’s Dolby Digital 5.1 soundtrack. While not on a par with something such as Saving Private Ryan, the audio did the job well for the most part. The soundfield presented an active affair that created a nice sense of the setting. All five channels received a good workout, as the mix featured fine stereo separation for the music and integrated effects material well. Material blended together neatly and smoothly, and the different elements seemed appropriately localized as well. The surrounds added a good sense of depth to the package, and they contributed quite a lot of unique audio during the battles. Since most of the movie consisted of fight scenes, this meant the rear speakers received a lot of work. Audio quality appeared fine. Though much of it must have been looped, dialogue seemed clear and natural throughout the film. I heard no concerns related to intelligibility or edginess. Music was bright and distinct and showed nice fidelity; the mix of score and songs came across with robust and lively tones. Effects seemed crisp and concise. Even with all the loud action onscreen, I never heard any distortion, and the material appeared accurate and vivid. Low-end response came across quite well, as the movie presented tight and taut bass. Overall, Black Hawk Down provided a satisfying soundtrack. The comments above about picture and audio replicated what I wrote about the original DVD release of Black Hawk Down, as I felt both versions looked and sounded identical. Where this new “Deluxe Edition” expands relates to its supplements, as the three-disc set includes tons of them. We begin with DVD One and three separate audio commentaries. The first presents director Ridley Scott and producer Jerry Bruckheimer. Recorded separately, Scott provides a running, screen-specific track, and it edits in Bruckheimer’s remarks at appropriate moments. The producer shows up only occasionally, as he adds a few notes about subjects like the history behind the movie, the logistics of working with the US military, and the film’s reception. Not surprisingly, Scott heavily dominates the commentary. A veteran of many other tracks, this may well be Scott’s best. He covers virtually every appropriate topic under the sun. I can’t hope to mention them all, but he includes matters like casting, effects and action set pieces, the facts of the real incident, his directorial style and choices, and location shooting. He remains engaging and informative at all times and really brings a sense of energy to the piece. Scott fills us in on a vast number of subjects and does so well in this simply terrific commentary. Next we get a track from author Mark Bowden and screenwriter Ken Nolan, both of whom sit together for their running, screen-specific piece. As one might expect, Bowden mostly discusses the real situations that the film depicts, and he also remarks upon liberties taken by the production. Nolan fills most of the track’s space as he gives us his perspective. Nolan helps provide the audience’s viewpoint, as he still seems excited to have been part of this major undertaking. He chats about how he based his script on Bowden’s book and other issues related to his text, but mostly Nolan offers anecdotes from the set. Taken individually, most of these fail to tell us a lot, but cumulatively they offer a fun picture of the production. Though it seems less stellar than Scott’s chat, the writers’ track remains consistently lively and entertaining. Finally, we find a discussion with Task Force Ranger Veterans MSgt. Matt Eversmann, Col. Tom Matthews (Ret. ), Col. Danny McKnight (Ret. ), and Col Lee Van Arsdale (Ret.). All four men were recorded together for their running, moderately screen-specific discussion. A simply fascinating chat, the veterans give us their own perspective on the real events and their depiction in the movie. They seem frank about what happened and they convey their thoughts in a concise and involving manner. The commentary rarely slows as they give us lots of valuable information and present it well. On a DVD with three strong tracks, this one might be the best of the bunch. In addition to these commentaries, we discover Filmographies that split into two areas. Under “Crew” we find director Scott, producer Bruckheimer, composer Hans Zimmer, editor Pietro Scalia, production designer Arthur Max, director of photography Slawomir Idziak, author Mark Bowden, screenwriter Ken Nolan, executive producers Simon West, Mike Stenson, Chad Oman and Branko Lustig. Within “Cast” we locate listings for actors Josh Hartnett, Eric Bana, Ewan McGregor, Tom Sizemore, William Fichtner, Sam Shepard, and Ron Eldard. ”Getting It Right” covers the origins of the book, its adaptation and early drafts, condensation issues, and attempts by the actors to form accurate characters. “Crash Course” depicts the actors’ training as well as some encounters with the real personnel who went through the incidents in the film. “Battlefield Morocco” looks at the shoot itself and includes elements about local crew, extras, costumes, location challenges, accuracy in filming, pyrotechnics, and Scott’s methods. “Hymn to the Fallen” examines the creation and recording of the score. “Digital Warriors” looks at the film’s visual effects, with a particular emphasis on computer generated imagery. Finally, “After Action Report” takes a little historical perspective on the events and talks of the movie’s legacy, especially in regard to the memories of the soldiers who fought. While the interviews include some good information, “Essence” works well mostly because of its behind the scenes footage. The program presents a surfeit of excellent footage that really helps give us a feel for the shoot. I’m not wild about the format, as the conglomeration of featurettes almost inevitably must seem somewhat disjointed. Nonetheless, “Essence” covers a great variety of subjects that make it a pretty complete examination of the film’s creation, and the candid footage adds a lot to its success. The show details the production well and enhances the project. Under the domain called “Image and Design”, we get a collection of additional materials. Designing Mogadishu runs 13 minutes as it shows a mix of production sketches, stills and video footage from the set, and interview clips with production designer Arthur Max. We learn of research put into the project and the methods used to recreate Mogadishu in Morocco. Max covers the subject in a concise manner and we learn a lot of the efforts put into the sets and visual elements in this good featurette. Within the production design archive we get a better look at the material displayed in the prior featurette. Split into seven sections, the archive shows a total of 149 stills. These mix various forms of art and sketches with photos of the sets. Though the images seem smaller than necessary, this offers a solid collection of pictures. Although the preceding archive used stillframes, the Storyboards come up as a running program. Actually, this seven-minute and 24-second piece lets you use your “angle” button on your remote, as it allows you to switch between Sylvain Despretz’s storyboards and a split-screen storyboard/shot comparison. You also get the option to listen to commentary from Despretz or the movie’s music. The “Introduction” gives us a quick biography of Despretz. Whichever visual method you select, the presentation of the boards seems fine, and it’s nice to get a look at this material. Despretz’s commentary adds some good reflections. He doesn’t discuss the specific drawings. Instead, he goes over his general thoughts about storyboards and gets into the way he works with Ridley Scott. He’s informative and engaging in this short piece. Speaking of the director, we get material from him in the Ridleygrams domain. There’s an “Introduction” to describe what they are - Scott’s storyboards – and then we find the same options presented for the “Storyboards” section. More commentary from Despretz appears here, though they now call it “analysis”. The piece lasts seven minutes, 15 seconds and seems like a satisfying depiction of Scott’s storyboards. Despretz discusses Scott’s artistic background, how that influences the way they work together and the director’s visual style. It’s another nice and useful chat. Jerry Bruckheimer’s BHD Photo Album offers another running program that lasts five minutes, 25 seconds. It opens with some video footage of Bruckheimer on the set and then goes through a series of his still photos. Bruckheimer also narrates many of the shots and tells us a little information about some of them. Nothing special appears here, but it’s a decent collection of shots. The final selection in the “Image and Design” domain, Title Design Explorations gives us some material from graphic artist Flavio (Kampah) Campagna. The opening text introduces the designer and then we can watch his work with or without commentary from the artist. The three-minute and 23-second piece doesn’t show completed titles, but we get some glimpses of Campagna’s ideas. The artist tells us about his career and what he wanted to do with the titles in his reasonably informative commentary. 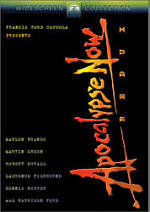 DVD Two ends with a collection of eight Deleted and Alternate Scenes. These run between 44 seconds and five minutes, 50 seconds for a total of 20 minutes and four seconds of footage. In addition to an alternate narrated opening, we get a little more action here. However, most of the segments expand on the various characters. This makes them interesting, but since they don’t do a ton to define the participants, it made sense that they got the boot. When we head toward DVD Three, we find a lot more great material. Two separately produced documentaries show up here. We start with a History Channel program called The True Story of Black Hawk Down. This 92-minute and 20-second program presents historical footage plus interviews with author Mark Bowden, former US ambassador to Somalia Robert Oakley, warlord’s son Hussein Aidid, UN Chief Security Officer Wayne Long, Mogadishu community leader Ashad Dedine, Somali militiamen Cabdulchi Maxamed and Jammaa Cabdulle, Aidid defense minister Abdi Oueybdid, US Army Rangers Aaron Williamson, Keni Thomas, Jeff Struecker, Mike Goodale, Anton Berendsen, Clay Othic, Aaron Weaver, Carlos Rodriguez, John Collett, Steve Anderson, and John Belman, US Air Force Combat Controller Dan Schilling, Special Forces operator Lee Van Arsdale, pilot Mike Durant, Somali spy for US “Sayyef”, Somali journalist Issa Muhammed, Somali medic Abukar Cali, and Aidid propaganda minister Adballahi Hassan. That’s an extensive roster of participants, and “True Story” makes good use of them. For viewers of the film, a lot of the information will seem familiar. Nonetheless, “True Story” presents it very well and offers a terrific little examination of the events that happened in October 1993. Actually, it does so better than the movie and appears quite gripping and moving. It’s a great documentary. Entitled Ambush in Mogadishu, the other documentary first appeared as an episode of Frontline on PBS. It runs 54 minutes and 58 seconds and uses the same format as “True Story”. We get interviews with Somali community leader Mrs. Abshir, Army Rangers Sgt. Randy Ramaglia, Specialist Mike Kurth, PFC David Floyd, Sgt, Keni Thomas, Specialist Jason Moore, Specialist Gregg Gould, PFC Anton Berendsen, Specialist Peter Squeglia, Specialist Aaron Hand, Col. Kenneth Allard (Ret.) of the National War College, Khalil Dale of the Red Cross, Director of Operations General Anthony Zinni, Ambassador Robert Oakley, Senator Richard Lugar, Deputy UN Commander Lt. General Thomas Montgomery (Ret. ), Deputy Special Envoy Walter Clarke, US Army Colonel (Ret.) Dr. Kenneth Allard, Aidid Defense Minister Abdi Hassan Awaleh, CIA Special Agent Gene Cullen, Richard Gabriel of the US War College, Sgt. John Belman, Aidid militia commander Captain Haad, Staff Sgt. John Burns, Lt. Col. Larry Joyce, and Sgt. Mike Pringle. Inevitably, parts of “Ambush” duplicate information heard elsewhere. At this point, we’ve heard the story of the attack eight billion times, so it would be impossible for “Ambush” to seem totally fresh. That said, it offers a new slant, partially because it provides a greater emphasis on the background behind the mission as well as the political climate. The stories from the soldiers involved also continue to seem moving and involving. “Ambush” provides yet another solid program in this terrific DVD set. After this we find a Mission Timeline. This displays a little map with icons for important information. It also provides a small box with relevant shots from the movie as well as brief text to describe the events. It seems like a concise way to review the material. Some multi-angle fun shows up in the Target Building Insertion area. The “Introduction” tells us what we’re about to see: many angles of the fast-roping sequence. We can then watch the five minute and 36 second sequence with production sound or with commentary from assistant director Terry Needham. Six angles are available, and there’s also a six-camera composite. Needham tells us about working with Scott as well as the planning and execution of the sequence. It’s a nice presentation of this material. Next we find three separate Question and Answer Forums. These took place via the British Academy of Film and Television Arts (10 minutes, 25 seconds), the Motion Picture Editor’s Guild (10:29), and American Cinematheque (11:42). The BAFTA chat took place December 14, 2001, and involved Ridley Scott, Jerry Bruckheimer, Mark Bowden, Ewan McGregor, Josh Hartnett, Jason Isaacs, and military advisor Col. Tom Matthews (Ret.). It provides a mix of new information and some bits we heard during earlier programs. The Editor’s Guild conversation happened January 10, 2002, and featured editor Pietro Scalia. He gets into expected topics about cutting the flick as well as potential alterations made after September 11. Finally, the American Cinematheque piece occurred on February 25, 2002, and presented Ridley Scott and Jerry Bruckheimer. They touch on some general issues as well as marketing and excised sequences. Scalia’s chat is the most interesting if just because it provides the highest level of information we don’t hear elsewhere in this set, but all three seem reasonably useful. A few minor bits round out the DVD in the “Promotion” area. We find a music video for “Gortoz A Ran – J’Attends” from Denez Prigent and Lisa Gerrard. It simply mixes fairly static lip-synch shots of Prigent and Gerrard with clips from the movie, and it seems like a pretty dull piece. In the theatrical poster concepts section, we find a whopping 68 stills with different advertising ideas. We get the movie’s theatrical trailer as well as some “Bonus Trailers” for Tears of the Sun and Basic. Lastly, the TV Spots domain includes 10 ads. With all of this content, is it possible that the set lacks anything found on the original DVD? Actually, only a little of that package’s material shows up here. We lose a 24-minute featurette called “On the Set” as well as some perfunctory text production notes in a booklet and trailers for some other Columbia films. However, this shouldn’t cause any tears. Everything from the written notes shows up in this set’s extensive examination of the film, and the fairly promotional “On the Set” also would seem redundant when seen alongside this release’s components. For the sake of completeness, it’s too bad this smattering of material didn’t appear here, but I don’t think we’ve lost anything. I must admit that as a film, Black Hawk Down didn’t do much for me. The flick had its moments and seemed generally decent and interesting, but it never really came together and delivered the moving, visceral experience I expected. The DVD provides very solid picture and sound along with a genuinely stunning set of supplements. If you’ve not already seen Black Hawk Down, I’d still recommend it for a rental. Obviously I don’t feel wild about it, but it does enough right to at least merit a look. I can’t support more than that sight-unseen, though the high quality of this spectacular release tempts me to push a sale harder; there’s so much great material here that I felt more entertained and satisfied with the extras than with the flick itself. Should owners of the original fairly bare-bones DVD get the deluxe edition? Yes, if they like supplements. If you really couldn’t care less about those materials, then there’s no reason whatsoever to upgrade. However, if those components interest you, this set will put you in heaven. Make no mistake: the deluxe Black Hawk Down is an astonishing package than must merit discussion as one of the greatest DVD releases yet seen.